MISSION, KS--(Marketwired - Jul 18, 2014) - (Family Features) Brown bag lunches and back to school go hand in hand. As you're gearing up for the start of a new school year, it's the perfect time to stock the pantry with healthy sack lunch options and after school snacks, too. While schools across the nation are adopting new U.S. Department of Agriculture standards to increase kids' access to healthy food, parents who pack lunch at home can take similar steps to reinvent the traditional brown bag into a more nutritious (and fun) lunch that kids will enjoy. But weighing the nutritional value of different foods at the grocery store can be confusing and time consuming. Many food retailers are providing tools such as the NuVal Nutritional Scoring System, which uses a scale of 1 to 100 to depict nutritional values at a glance, to help make choices easier. In stores using the NuVal system, food scores are included on grocery store price tags, making it easy to compare options. Higher scores represent foods with higher nutritional value. Food scores can simplify the process of building a brown bag lunch that is better for the kids. "I always recommend small steps to parents," said Marisa Paolillo, a NuVal nutritionist. "A good place to start is swapping the same types of food. For instance, NuVal scores for yogurt can range from 7 to 100, depending on sugar content and other factors. It's easy to swap a low-scoring product for a higher one, and kids probably won't notice the difference." Paolillo also recommends talking with your kids about the choices you make at the grocery store. Engaging them in the selection process teaches them to make better selections for themselves, such as when they are making meal choices in the lunch cafeteria or snacking with friends after school. You can learn more about the NuVal scoring system at www.nuval.com, where you also can find recipes and food swap ideas for school lunches and other meals for the whole family. The NuVal Nutritional Scoring System allows you to see the nutritional value of food on grocery shelves at a glance and easily compare food options to make nutritious choices. What does a NuVal score tell me? Food is scored on a scale of 1 to 100. Although there is no "magic score" to aim for, the higher the score, the better the nutrition. What nutrients and factors affect a food's NuVal score? Each score reflects the overall nutritional quality of a food or beverage. It takes into account the quality of calories derived from more than 30 nutrients that have both favorable (i.e. fiber, Omega 3, vitamins and minerals) and non-favorable (i.e. saturated fat, transfat, sodium and sugar) health impacts. Where can I find a NuVal score? NuVal scores are displayed directly on shelf price tags in the grocery store, so you can compare overall nutrition the same way you compare price. 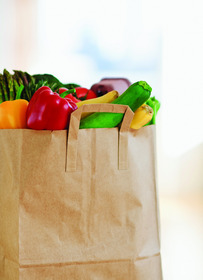 Find a participating store, shopping tips or scores for many common grocery items at www.nuval.com. 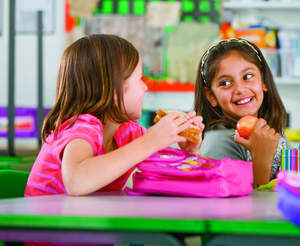 After-school snacks need to be satisfying and fun, but not full of sugar, salt and unneeded fat. Help your kids snack smarter with these tips. Encourage kids to invent their own snack mixes by combining dry, whole-grain cereal, dried fruit and unsalted nuts or seeds. Serve apples with nuts and raisins (as temperatures chill, try baking apples for a warm and delicious treat). Offer frozen juice bars made from blended fresh fruit or 100 percent juice. Invite the kids to participate by making their own concoctions adding whole or crushed berries or bananas for added nutrition. Brown bag sandwiches don't have to be boring. Swap a traditional sandwich for one of these two fresh takes from NuVal. Pair humus dip with whole-grain bread points or multi-grain tortilla chips. Add baby carrots, cucumbers, cherry tomatoes and cubed (1/3 cup) low-fat cheddar cheese chunks for dipping. Mix together 1/3 cup low-fat cheddar cheese with shredded lettuce and tomatoes. Add flavor with black olives and fresh salsa or guacamole, then roll into a corn tortilla or whole-grain pita wrap. Swap white bread for whole grain or 100 percent wheat. Pair carrots, cucumbers and grape tomatoes with yogurt dip, or smear apple chunks with almond or peanut butter. Include a serving of low-fat or fat-free dairy, such as 1 cup of yogurt, 2 slices of Swiss cheese, 1/3 cup low-fat cheddar cheese or 1 cup of fat-free or low-fat milk. Swap salty, high-fat chips for popcorn or multi-grain tortilla chips or vegetable chips. Provide 2 ounces of lean, roasted, low-salt beef, pork, chicken or turkey, or non-meat options such as 2 ounces of raw or roasted seeds or nuts.